Book of Ages, by Jill Lepore. This is a book about reading and writing as much as it is a book about Jane Franklin, Benjamin Franklin’s little sister. Book of Ages has been reviewed elsewhere, and Lepore wrote a really lovely piece in the New Yorker called The Prodigal Daughter that is unfortunately behind a subscription firewall, but which I have read on actual paper. If you can get hold of it, I do recommend reading it before you read Book of Ages. It makes the book all the more poignant to know something about Lepore’s process. This is, in many ways, another book about mud and misery (see the best bits of Longbourn). 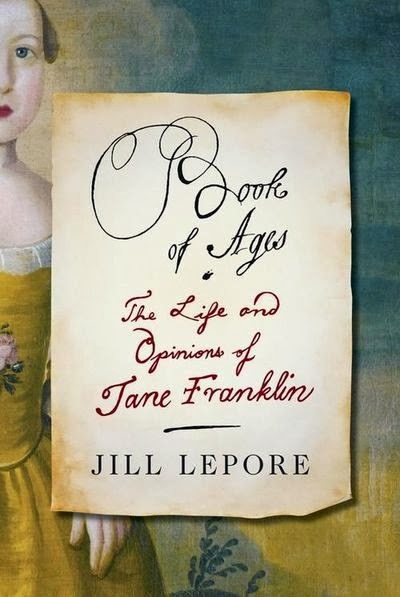 Because Jane Franklin Mecom (her married name– she married at 15) left behind so little, Lepore builds much of her story out of the context of Boston and New England in the mid-18th century. It’s not exhaustive in its detail, and that’s fine: the book is an easy, comfortable read that still provides well-researched information about the lives of women in the 18th century. I finished it over a week ago, but details still remain (and that is a testament to Lepore– these could have been supplanted in my mind by details of exterior water meters, skunk removal techniques, or indexes for early vital records). Among the details I recall: Funerary and mourning customs, from published sermons to the distribution of mourning gloves and rings; soap making and trades practiced by small holders in home workshops; Jane Franklin Mecom’s wartime flight to Rhode Island; the power and practice of extended family networks. It also reminded me of the differences in educational methods or standards for boys and girls, which helps remind us all of the importance and significance of the ideal of free public education for all. (We had some early proponents here in Rhode Island.) What might Jane Franklin’s life have been like in other circumstances? Honestly, even if she’d been well-off and well-educated, as as woman in the 18th century, she would never have had the same chances as her brother, no matter how evenly their intellects might have been matched. If anything, that’s reason alone to read Lepore’s book, to celebrate the life of a woman who was both ordinary and extraordinary, and to recognize how much closer to all the anonymous, disappeared women of the past we can get through this example.